Time For Greece To Leave The Euro? Many international investors continue to ask the question whether Greece will actually leave the Euro? A newly installed leftist government in Greece, does not change the dire fiscal circumstances that the country finds itself in. At the end of the month the current financial aid package ends and Greece will need to renegotiate the crushing debt, that the country has accumulated over decades of profligacy. The open secret that no one wants to acknowledge, is that Greece is essentially bankrupt. The country is at an economic crossroads. There are no easy choices, in a country where irresponsible politicians had promised voters much more than what was prudent and even possible, in the best set of circumstances. After 5 years of austerity under a conservative government Greece has achieved a milestone of sorts. That is the primary government budget minus debt repayments and interest is back in balance. This was not easily achieved and was done under the guise that Greece had no choice, but to do what was necessary, to bring the country’s budget back into positive territory. It was part of a larger effort to prevent Greece from being forced to leave the Euro. The new government in Greece (Syrzia) has made an electoral promise that there will be a reckoning with the trio of lenders consisting of the European Central Bank (ECB), the European Commission (EC) and the International Monetary Fund (IMF). It will be these three organizations who will determine if the Greek government should continue to get lower cost financing and the banks more funds from the ECB. It is all dependent on whether officials from these institutions determine that measures of austerity, are moving forward in Greece. Here in lies the problem. Syrzia at this point, refuses to accept that these international organizations have any authority over Greece. The summer of 2015, will bring the debt crisis in Europe to the foreground once again. 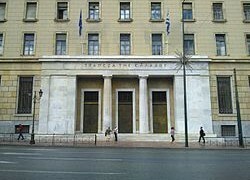 At that time, the Greek government will need to make a payment of 6.15 billion Euros, the equivalent of $7 billion USD (United States Dollars) to the ECB. Greece will obviously not have the money on hand, to pay this loan. 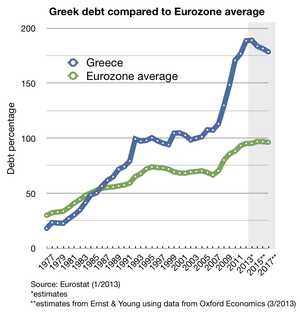 It matters enormously, since 60% of Greek debt is owed to the Euro-zone. The bottom line is that the Greeks want continued access to the $273 billion USD (240 billion Euro) bailout, but do not want to maintain many of the austerity measures put in place by the previous government. These economic reforms had been implemented on the insistence of the international financial institutions, in exchange for previous loans and aid packages to Greece. In the run up to this impasse, the financial uncertainty is having a strong effect on the European markets especially in Greece. The stock exchange there is down by some 25% this year and a total of 40% since last June. Bond yields have surged upwards as more investors are dumping them. The interest rate on them had breached over 11% earlier this month and now sit just below 10%. The stocks of major Greek banks have collapsed. Without further funding from the ECB the banks face possible runs, as consumers rush to withdraw dwindling supplies of ready cash. The Greek government under the new Prime Minister Alexis Tsipras and his Finance Minster Yanis Varoufakis came to power pledging to wipe roughly 50%, of the country’s insurmountable sovereign debt. They are insisting to their counterparts in Europe namely Germany, that the terms for debt repayment must be renegotiated. The instruments to be used include debt restructuring, debt exchange, write-offs and other accounting methods, to ease the overall burden on Greek finances. If that effort fails, Mr. Tsipras has threatened that the Greeks may well need to leave the Euro. The Greek government is taking the gamble that Germany and the rest of Europe, will sooner or later make concessions. This would then prevent default and the necessity of Greece having to depart from the Euro. It would also prevent a new round of investor anxiety over the entire scenario. 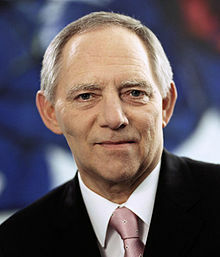 The problem for Mr. Varoufakis and the Greek government in general is that his counterpart in Germany Mr. Schauble, is insisting that the Greeks adhere to the terms of the previous agreements. These include the spending restrictions and other facets of the austerity program. He is joined in this viewpoint by the finance minster from the Netherlands, who represents the Euro-zone in the negotiations. 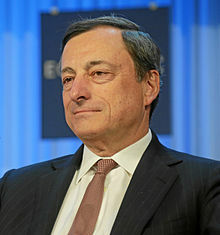 Mario Draghi, head of the ECB is also determined that the Greeks stick to the agreed upon principles of austerity. These officials are loathe to accept an untidy Grexit, where Greece ends up leaving the Euro and the resulting disarray for the rest of Europe. However, they collectively know the end result if they reopen negotiations. It could easily set up a chain reaction in other nations like Italy and Spain. These countries are likely to insist on a change in terms for their own austerity packages. It would also undermine the process for the Euro-zone in dealing with nations that have overextended themselves in the future. 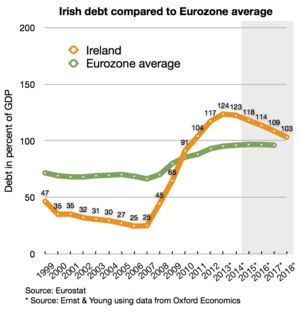 Using the example of Ireland, the country went through 7 difficult years of restructuring and self discipline, that finally allowed an exit from austerity last fall. Growth has returned and the Irish are now finally allowing an expansion in government spending. Portugal also exited its bailout in the second quarter of 2014. In return for 78 billion Euros ($98 billion USD) in 2011, the near bankrupt country made cuts of 30 billion Euros ($34 billion USD). This was 12 billion more than originally agreed to and ended up being 18% of GDP (Gross Domestic Product). Total debt for the country rose from 94% of GDP in 2010 to 129% in 2013. Yet, the budget deficit dropped from 9.8% of GDP in 2010 to 4.9% by 2013. The 3% goal will be reached this year if the country continues with austerity. Portugal plans to reduce the deficit to 2.7% in 2015, by maintaining the cuts in spending and entitlements, in addition to the steep tax increases. Cuts in wages and pensions as well as higher taxes in Portugal, brought an expected drop in consumption and investment. Unemployment reached record highs and emigration for the country accelerated during the worst part of austerity. Still, tourism and exports remained resilient in Portugal throughout the economic and fiscal self-discipline. So much so, that the country was able to enjoy the first trade surplus in 70 years in 2013. The credit agencies eventually raised their ratings and outlooks, as interest rates on government bonds fell sharply. 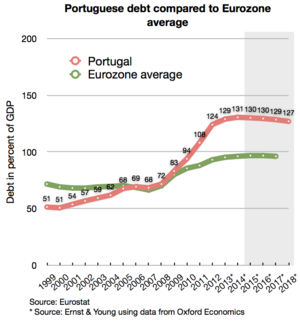 Public debt in Portugal at 133% of GDP and 3rd highest in the Euro-zone, is due to drop to 123.7%. It is finally reversing, as public spending and deficits are on the decline. Unemployment is on the way down and growth although meager, has returned. The main opposition, the center-left Socialist Party is as usual, demanding more government spending. With elections due later this year, it is difficult for the government to maintain the present economic course, but hopes the public will reward them for steering Portugal through a very difficult period. That did not happen in Greece, when elections were held last month. Greek voters were willing to entertain the idea that they could escape austerity, with a change in government. The conservative government that took the responsibility of the disaster that had become of Greek finances, was punished at the polls by the electorate. The election results are understandable. Greece has been in crisis for 6 years now. The citizenry has endured rather large budget cuts, heavy taxes and unemployment rates over 25%. Millions have lost their economic security and have experienced a major cut in their standard of living. That it was the same irresponsible type of government promises in the past, that had led to this present fiscal disaster escapes them. The Greek people have once again elected a government, that insists that debts can be incurred and not repaid. So far the European money managers have not blinked, in spite of Greek cajoling and subtle threats. 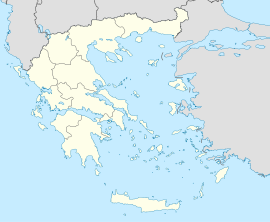 As was done to Cyprus in 2013, within hours of the meeting between the Greek Finance Minster and the head of the ECB, the major source of inexpensive funding to Greek banks was severed. Mr. Varoufakis has openly stated on many occasions, that the problem in Europe is not trying to fix Greece, but getting Germany to invest more throughout the 28 member countries in the Euro-zone. In response the Germans have let it be known that not only can Europe withstand a Greek debt default,but an exit from the Euro. The German finance minster takes the view that unlike in 2012, the markets have already factored in a debt default by Greece. Furthermore, after a brief time of uncertainty and turmoil, the financial fallout from Greece leaving the Euro is manageable. He apparently has the full support of the overly cautious, German Chancellor Angela Merkel. Unlike the situation before the 2012 debt restructuring, 80% of the remaining Greek debt is now owned by the public sector, which can weather the uncertainty of a Grexit much better than private institutions. Therefore the feeling among European financial leaders, is that they can afford to wait Greece out. As conditions worsen in Greece, and new financial aid is refused, the Greek government will be forced to return to the original austerity agreements. If that strategy fails, the lack of currency in itself, will force capital controls in Greece. This will be a last ditch attempt by the Greek government to try to save the banks. The resulting chaos would most likely lead to a public outcry and a backlash against the new Greek government. As the theory goes, this would finally force Prime Minster Tsipras to make a new accommodation. Instead the talks between Greece and the Euro-zone creditors are becoming more acrimonious this week, with the new Greek government accusing the rest of Europe of trying to subvert democracy in Greece. 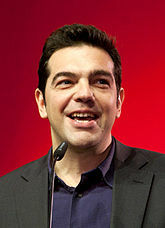 Syriza came to power promising an overthrow of the European austerity regime. It might once again, be a political promise made to the Greek people, that cannot be kept. If these high level talks fail, what will result is the biggest default in world history and Greece leaving the Euro in a matter of weeks. The most the Europeans are offering is an extension of time up to 6 months on the terms of debt. What are the financial leaders of Europe demanding of Greece in terms of austerity? To maintain the present tax policy, continue to privatize public sector assets, more labor market reforms, and continued controls on pensions. The most difficult part of the program, calls for the fiscal surpluses in the primary government budget, not only to be maintained but to increase. It was 1.5% in 2014 and will need to be raised to 3% this year and 4.5% in 2016. These constraints on spending, are an anathema to the new government of Greece. It would prevent Syrzia from using additional money to fund new welfare and anti-poverty programs. It calls for increasing fiscal tightening and discipline, during hard economic times. It is totally in opposition to what the new Greek government had promised voters. Not surprisingly, the fiscally irresponsible American government under President Obama, is voicing its support for the Greek refusal to comply. While in Europe itself, the Greeks are finding few allies to bolster their position. For good reason, they are actually helping to shoulder the cost for past Greek extravagance. Notwithstanding the risks for Europe as a whole, what will debt default and the leaving of the Euro mean for Greece? The drachma would return and immediately fall in value, against the Euro and other major currencies around the world. The Greek government would have to move quickly, to prevent the mass withdrawal of Euros being attempted by depositors. There might be some civil disorder, as banks are forced to limit withdrawals. 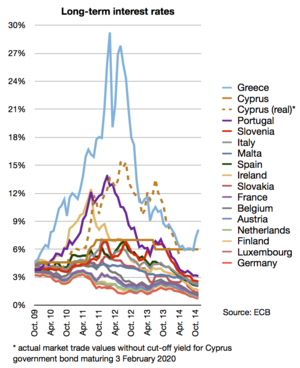 Greek banks would be on their own, since they could no longer access emergency funds from the ECB. After the initial shock, there will be more social unrest as the new drachma loses at least 50% of its value. This of course will lead to inflation. Prices would naturally skyrocket in Greece, but would in time stabilize, since unemployment remains above 20%. The Greek government would be free to begin its own QE (quantitative easing) program in short order. The present government would return to deficit spending, free from all constraints. More cautious investors would of course demand much higher interest rates, in case of a new government default. The standards of living for many Greeks would fall even further, as the economy adjusts to the new fiscal and monetary regime. The people of Greece will discover that some debt eventually is repaid, in some form or another. Long term, there will be some advantages realized for Greece. Exports would revive as Greek merchandise sold overseas, would decline in price. Certain sectors of the Greek economy would certainly benefit. An example would be tourism. 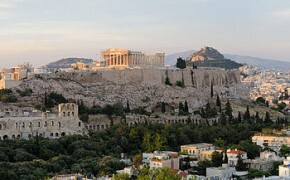 Visiting Greece would become a bargain once again, as would purchasing real estate there. For the creditors of the present Greek sovereign debt, they will be left with $500 Billion USD (441 billion Euros) in bad loans. Foreign bank exposure equals about $46 billion USD. Close to 16% is owed to the IMF, the rest to the ECB and other European countries. This cost will eventually be borne by taxpayers of these countries and possible future liens on Greek assets abroad. The main concern now would be a spreading financial contagion and more exits from the Euro. In 2012 this situation would have been far more likely, at present it is a threat much reduced. 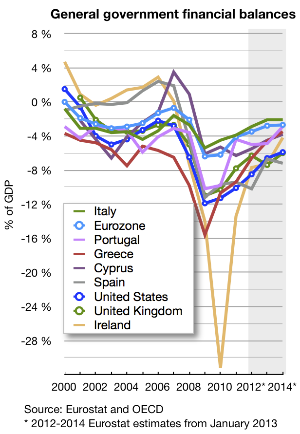 Given the existing economic situations in Ireland, Italy, Portugal and Spain further withdrawals from the Euro are unlikely, at this juncture in history.